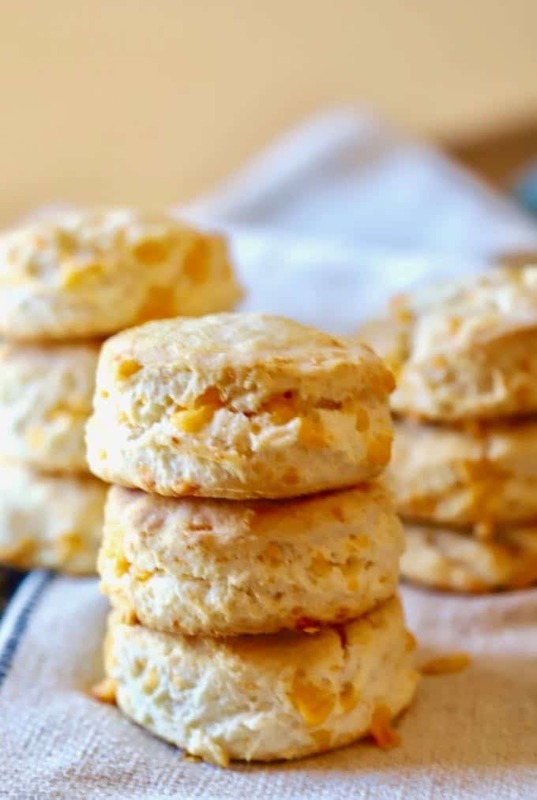 With just three ingredients, Southern Cheddar Biscuits are light, flaky, tender, Southern-style cream biscuits with sharp gooey cheddar cheese. Eaten hot right out of the oven with a pat of butter, these delicious cheddar biscuits fairly melt in your mouth. I can see some of you right now rolling your eyes, homemade biscuits from scratch, really Sharon? The answer is yes, yes, yes! You know me, and you know I am not much of a baker! 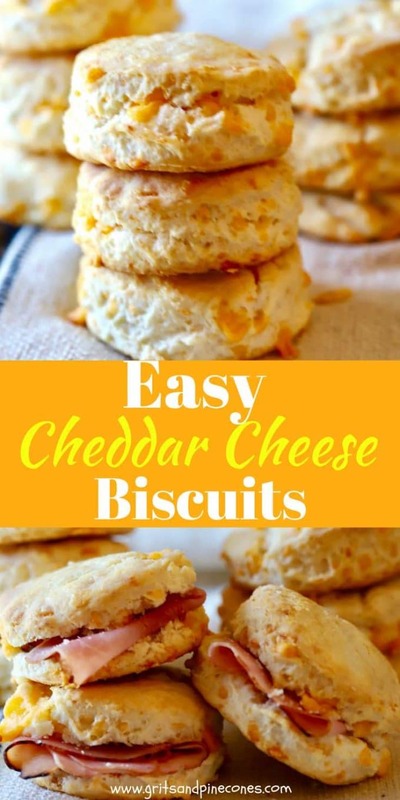 That’s why I am so excited to share this versatile and easy cheddar biscuits recipe with you. 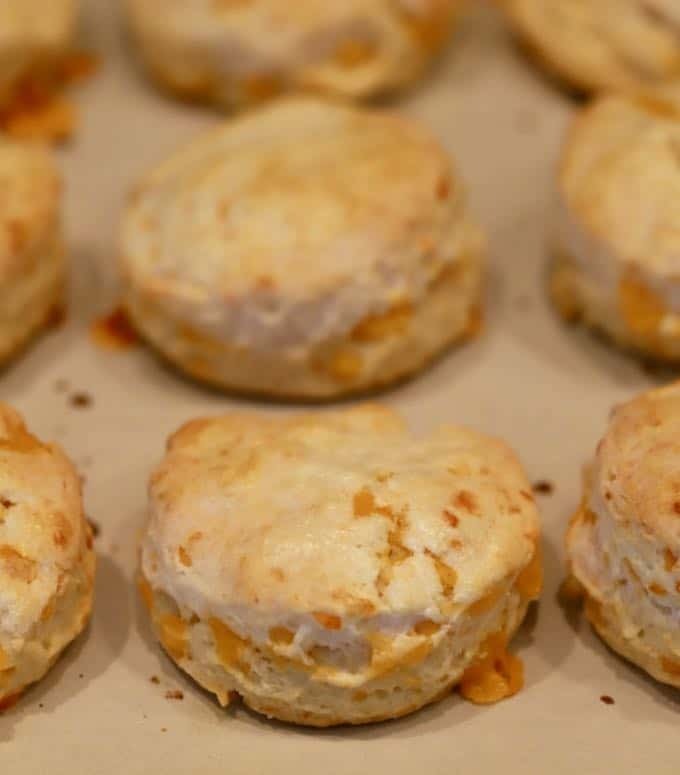 Just in time for your Easter brunch or dinner and with just three simple ingredients, these delectable cheesy cream biscuits literally only take minutes to prepare, and you don’t have to have any special baking equipment; no rolling pins, no special biscuit cutters, no pastry blenders. If you have the ingredients, plus a bowl, a glass, a spoon, and a baking sheet, you are in business. And the simple ingredients I mentioned are self-rising flour, heavy cream, and sharp cheddar cheese. That’s it! It’s a cheddar cheese biscuits miracle! 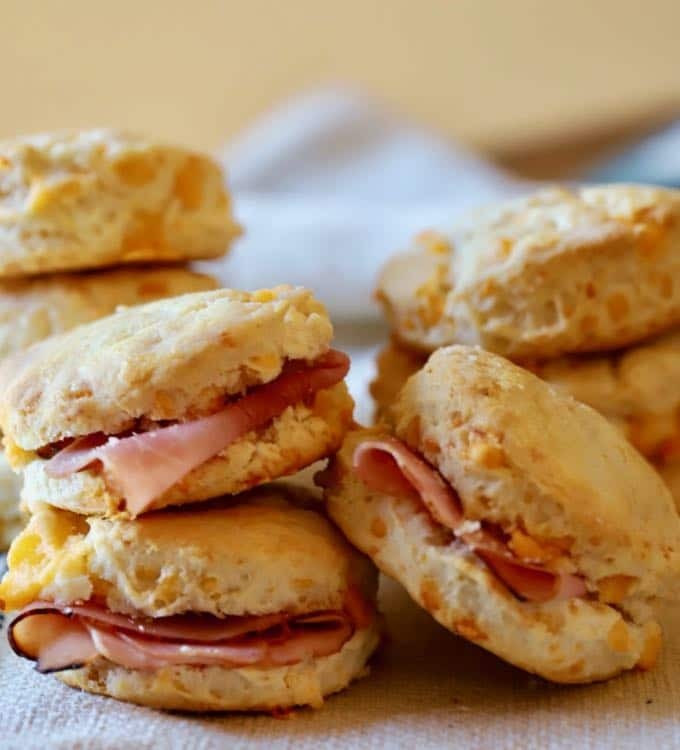 And if all of this wasn’t reason enough for you to make these yummy cheddar biscuits, as delicious as they are with just a pat of butter, they are every bit as scrumptious with a dab of jelly, a slice of ham, a piece of bacon, or a fried egg in the middle. 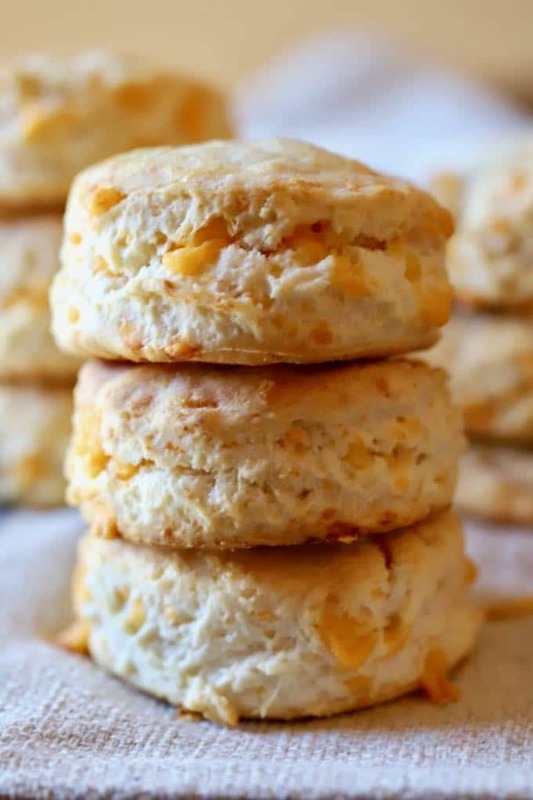 And a bonus, these Easy Southern Cheddar Biscuits freeze really well so you can make them ahead, freeze them, and then just pop them in the oven whenever you want freshly baked hot biscuits. 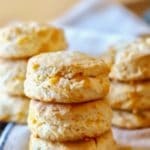 If you love hot biscuits like I do, but don’t want all of the fuss of a regular homemade biscuits recipe, you might also like these easy southern-style biscuit recipes: Cornmeal Biscuits with Orange Butter, Sweet Potato Biscuits with Cranberry Aioli, and Tomato Cobbler with Cornmeal-Cheddar Biscuits. 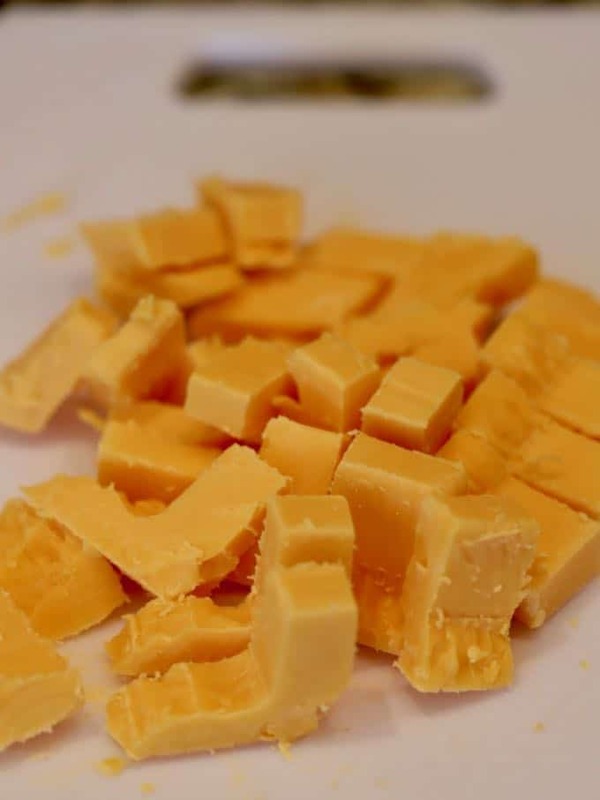 Cut up the cheese into chunks. Add the flour and cheese to a food processor fitted with a metal blade and process until the cheese is finely chopped. Add the cream and process until the mixture comes together and pulls away from the sides. If the biscuit dough seems dry and doesn’t come together, add just a bit more cream. Grate or shred the cheese. Add the cheese to a large bowl and toss with the flour. Add the cream, stirring until all of the ingredients are moistened and come together. If the biscuit dough seems dry and doesn’t come together, add just a bit more cream. Place the dough on a lightly floured surface and lightly pat it out into a disk 1/2 to 1 inch thick. Alternatively, you can use a rolling pin to evenly and lightly roll out the biscuit dough. 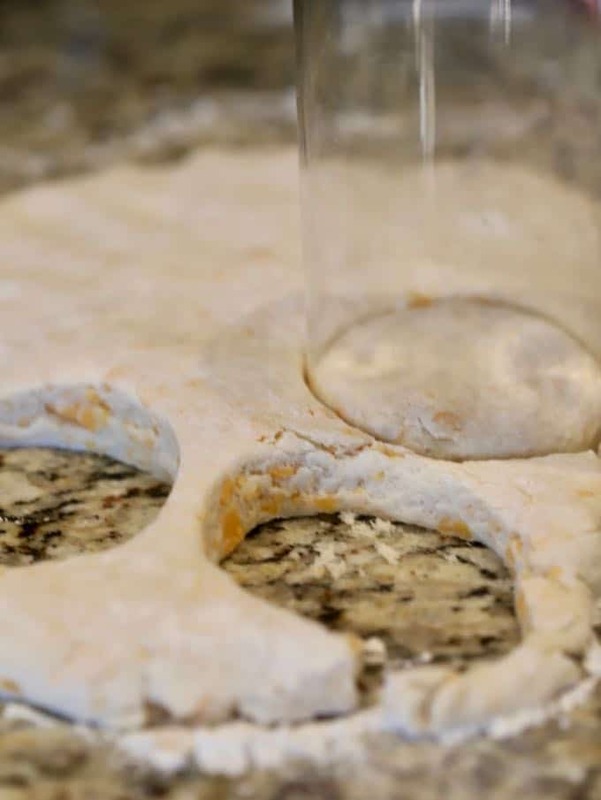 Use a 2-3 inch biscuit cutter or glass to cut the biscuit rounds. Place the cut biscuits on a non-stick or parchment paper lined baking sheet. Brush the tops with just a little cream to help them brown. Bake the biscuits for 15-18 minutes, or until they are a light golden brown. Serve immediately while they are still hot. If you don’t have self-rising flour and want to use all-purpose flour, simply reduce the amount of flour by two tablespoons and add 1 tablespoon of baking powder and 1 teaspoon of salt. Mix well. My dough was approximately 3/4 inches thick, I used a 3-inch glass to cut the biscuits out, and I ended up with 9 biscuits. If your dough is thicker or thinner, or you use a smaller glass or biscuit cutter you will end up with more or fewer biscuits. The less you handle the dough, the more tender the biscuits will be. If you overwork the dough, the biscuits will be tough. For this reason, I don’t recommend combining the leftover dough scraps and rolling them out again to make more biscuits. For the best results in freezing these biscuits, place the raw cutout biscuits on a baking sheet and freeze for about an hour. After the biscuits are frozen, place them in an airtight freezer food storage bag and store them in the freezer until you are ready to bake them. You don’t need to thaw the biscuits, just bake for 25 minutes. If you have any leftover cheddar biscuits, they are great for breakfast the next morning split and toasted under the broiler. With just three ingredients, Southern Cheddar Cheese Biscuits are light, flaky, tender, Southern-style biscuits with sharp gooey cheddar cheese. Eaten hot right out of the oven with a pat of butter, these delicious biscuits will fairly melt in your mouth. Add the cream and process until the mixture comes together and pulls away from the sides. If the biscuit dough seems dry and doesn't come together, add just a bit more cream. Add the cream, stirring until all of the ingredients are moistened and come together. If the biscuit dough seems dry and doesn't come together, add just a bit more cream. Bake the biscuits for 15-18 minutes, or until they are a light golden brown. Serve immediately while they are still hot. Tips: If you don't have self-rising flour and want to use all-purpose flour, simply reduce the amount of flour by two tablespoons and add 1 tablespoon of baking powder and 1 teaspoon of salt. The less you handle the dough, the more tender the biscuits will be. If you overwork the dough, the biscuits will be tough. For this reason, I don't recommend combining the leftover dough scraps and rolling them out again to make more biscuits. 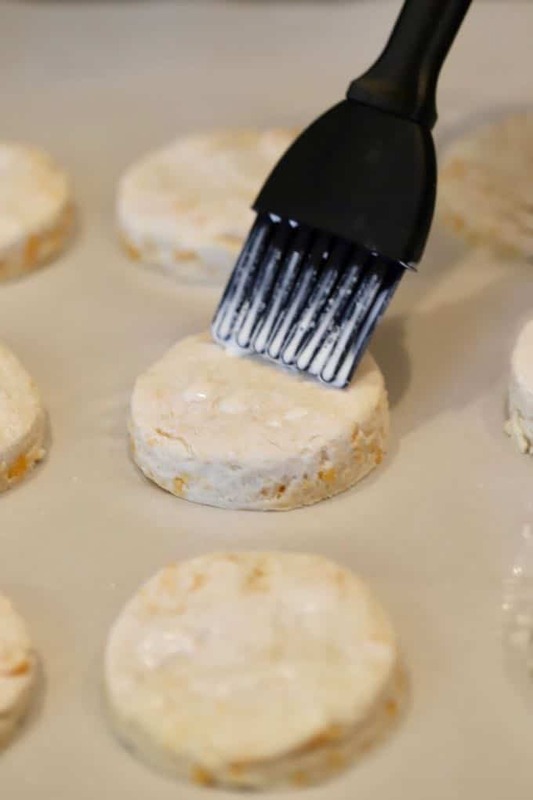 For the best results in freezing these biscuits, place the raw cutout biscuits on a baking sheet and freeze for about an hour. After the biscuits are frozen, place them in an airtight freezer food storage bag and store them in the freezer until you are ready to bake them. You don't need to thaw the biscuits, just bake for 25 minutes. If you have any leftover biscuits, they are delicious for breakfast the next morning split and toasted under the broiler.